Ismael’s coffee has performed well at COE over the past three years, but this win, he says, is proof that hard work pays off. The Andrade Bros farm is located in the Cerrado region of Brazil, a state on the west side of Minas Gerais Ismael describes “the new frontier of Brazilian coffee”. Ismael’s family has produced coffee since 1901 at the Capim Branco Farm in Carmo do Paranaíba, High Cerrado. Initially, production was on a very small scale, too small to be noticed. 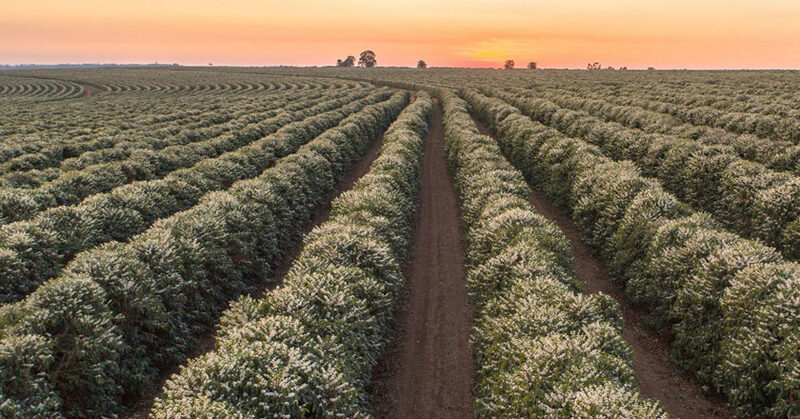 It was only after frost decimated the coffee producing region of Paraná in 1975 that the government started to incentivise producers to come to Cerrado with new technology to reinvigorate a new area of coffee production. Cerrado was already established as a soy, cotton, and corn agricultural region, but Ismael’s family was a Cerrado coffee producer from the start. Ismael and his brother Eduardo Andrade later acquired São Silvestre farm in Serra do Salitre in Minas Gerais, and have watched the land evolve. Ismael says because Cerrado was considered more of an African savannah than a high fertile region ripe for coffee producing, new technology and the introduction of fertilising gradually helped turn the safari-like landscape into volcanic soil, rich for coffee production. That boom has now settled and producers are developing new techniques for drying and new coffee profiles that are gaining attention from across Brazil, and beyond. Coffees takes care of the farm’s micro-lots. Yellow Catuaí is the most successful cultivar grown at the Andrade farm, but Yellow Icatu and Red Catuaí are also grown. With an altitude between 1100 and 1200 metres, the Andrade farm has one of the highest altitudes of coffee production in Brazil. This combined with the region’s stable weather between wet and dry seasons makes for perfect conditions to grow natural-processed coffee, the most commonly used method in Cerrado. Thanks to Andrade Bros’ high altitude, Ismael says it’s intrinsic that the cherry’s maturation and drying is slow to help achieve a desired profile. “This way, we can add fermentation processes to provoke the bean to give us complexity in the cup,” Ismael says. The first step is separating ripe from unripe beans. Ismael says it’s tricky to separate natural processed green beans from ripe in mass volume but insists cherries are only picked at the perfect point of maturation. The farm harvests about 90 per cent of the cherries fully ripe after the region’s one flowering each year. Micro lots are 100 per cent picked manually, but for larger volumes, the farm uses electronic separation to read the colour of the beans and spit out only the ripe cherries. 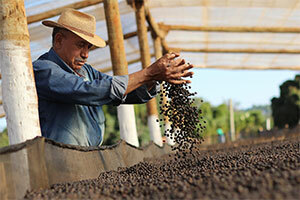 The coffee is brought to raised beds and continues to dry slowly for about 20 to 30 days. Pulped coffee is dried for half that time. “The longer we expose the beans in the drying process, the greater the risk of damage, so we have to treat them carefully,” he says. Ismael knows all about risk assessment and finding solutions as an engineer by trade. After he graduated from university, Ismael pursued a career in finance but quit after five years to help the family farm improve its processes and coffee quality. “It was a challenge and is a challenge every day. A challenge to improve the husbandry, the quality, to innovate, and even the way we sell coffee,” Ismael says. It was only when Ismael helped found the Brazil Specialty Coffee Association (BSCA) in 1991 together with a group of 14 members that they made a collective mission to help showcase Brazil’s potential as a specialty producing nation, not just a traditional one. The BSCA supports all small coffee producers in the region to improve quality, which improves sustainability, and helps producers reach importers worldwide. 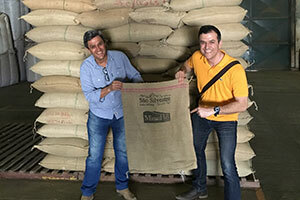 Producer Ismael Andrade of Andrade Bros Estate Coffees with Minas Hill Director Marcelo Brussi. That was 27 years ago. Back then, Ismael says Cerrado had good quality coffee but it wasn’t recognised. Now, of course, the quality is much higher, and it’s thanks to direct trade partnerships that gives Ismael a chance to present his produce straight to the consumer. “We used a middle man in the beginning but now we’re 100 per cent direct trade, and it’s very important for us. Transparency is very good, we have a direct channel between us and the end consumer, and this allows us to exchange knowledge of what’s going on at the farm level and what the consumers want, so that we can produce better coffee that the market requests,” Ismael says. What the market wants more than ever, Ismael says, is fermented coffee. For this reason, Ismael says his relationship with Minas Hill and its Director Marcelo Brussi has been vital to his understanding of Australia’s market trends. Ismael says Minas Hill Coffee also understands the importance of keeping stock levels high, and allowing Australian customers to buy his coffees at any time, at a competitive price. “Nowadays, Minas Hill Coffee can sell our coffees from one bag to a container-load direct trade through a competitive and safe contract,” Ismael says. Minas Hill Coffee supplies three ongoing coffees from Ismael, including his farm’s Dolce Cerrado, Yellow and Red Catuaí, perfect for espresso blends, a natural raised-bed Peaberry, a coffee that stands out for its acidity and balance, and a natural process Yellow Icatu. Minas Hill also brings in a number of micro-lot coffees from Andrade Bros each year. This season, Minas Hill will import two micro-lots from Ismael’s farm to Australia, including a anaerobic fermentation Red Catuaí with a score of 93 points. From what Ismael understands about Australian coffee, he says it’s a very well developed and discerning specialty market the world should envy. He’s been to Melbourne to attend the Melbourne International Coffee Expo, and was amazed at the high level of coffee found in every corner shop. “Melbourne is one of the most developed markets I’ve ever seen. It’s a high level coffee city that every market around the world should look too,” he says. Just as Ismael has experienced Melbourne, the newly crowned COE champion plans to travel to as many countries and industry events as he can to share his mission for Brazilian coffee and the Cerrado region – such is the life of an award-winning producer.